Last night's tempo run was mehhh. I had six miles to do with four at tempo on the dreadmill before my yoga class. I felt good through the first mile and a half and then I noticed that as I was getting more fatigued my form started to get sloppy. Over the next mile I paid attention to foot strike and stride, but couldn't quite pinpoint the exact muscle I needed to prevnt my foot from flopping like a fish every time it hit the treadmill. I finished feeling pretty good though. Six miles in the books with some nice yoga to stretch afterwards. 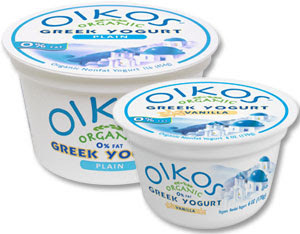 Not too long ago, the fabulous Kristina sent me some coupons so I could test out Oikos Greek Yogurt. I have never ever eaten Greek yogurt before this, but I have always been a huge yogurt lover so I was excited to try it. The only flavors my grocery store had were Plain and Vanilla. I hattttte plain yogurt, so I went with the Vanilla, though I was really hoping to try the Blueberry. (I heart Blueberry yogurt). I wasn't sure what to expect, but Kristina told me Greek yogurt is super creamy and she was right. The yogurt was creamy and packs all sorts of nutritious goodness (aka, way more protein than regular yogurt). I tried the yogurt three ways, by itself, in my smoothies and mixed with cereal. By itself, I wasn't a huge fan. I think it's because I'm so so so used to normal yogurt that the change just threw me. The taste wasn't bad, I think it was more the thickness that I wasn't used to. I felt the same way when I tried it with cereal. I just wasn't feeling it that way. But I did really like it in my smoothie. It made it a lot thicker and creamier and definitely upped the nutrition value for the smoothie. It kept me full way longer than my smoothies with regular yogurt do. So thanks to Kristina for letting me test it out! It's something I might try from time to time in my smoothies! 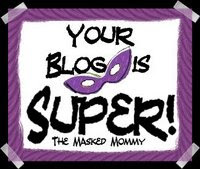 The other day Carolina John gave me a super sweet blog award. He said I was Super! In keeping with the game, I'm going to play along. I decided I'm going to dedicate these blog awards to the people who have been around since the beginning (three years ago when I started) I know some of them have already received this award, but I'm going to recognize them again anyway, because they've been reading and inspiring me for so long so I think they deserve it! 1. Stacy at Dare to Tri. She left one of her first comments on my blog back in June 2006. 2. Denise at Firefly's Running. Found her first comment in July 2006. 3. Neese at Run with Neese. First comment in August 2006. 5. Wes at A Code Geek's Tail. His first comment was in May 2007. There were other people between him and the early ones, but many no longer keep their blogs or have gone private for personal reasons (like Java Mom). So thanks to all of you who have been reading for so long. You guys rock. Not that I don't love my newer readers too. I mean I pretty much think you are all awesome because you read my babble every day! Very sweet :-) I hear once you go Greek you never go back! I've read some good and bad about this yogurt, so I'm anxious to try it for myself. I think just about everyone has tried Oikos at this point! I too have some coupons that Kristina sent me, but I have yet to get around to actually purchasing any. Thanks for the blog award! And yeah, I seem to believe that in a world full of Jesses, I am still the only one. I must be pretty self-centered, huh? Kristina sent me coupons too but I haven't gone to the store in a long time to actually make the purchase. BTW I always have issues when attempting the treadmill tempo run. Hopefully the next one goes better for ya! Who knew you were so kink-KAY, sister! I like Greek yogurt, but it's so expensive!! So this might be a silly question, but what's the difference between regular yogurt and Greek yogurt? Is the Greek Yogurt the new POM? Not too long ago everyone was posting about POM Juice (fabulous stuff). So how do we jump on this train of creaminess? I love Greek yogurt. Havn't seen this brand before. Thank for sharing it! I'm a physician and former faculty member at Harvard and Stanford Medical Schools. I discovered your blog while looking for the best health writers on the web. I reviewed your posts, and think your writing would be a great addition to the Running Community on Wellsphere, a top 5 health website that has nearly 5 million visitors monthly. If you would like to learn more about how you can join our Health Blogger Network, republish your blog posts and be featured on the Wellsphere platform, just drop me an email at dr.rutledge@wellsphere.com. some days are like that on the tm. i was pretty fish-footed myself yesterday :-/ i'm sure as the training continues your form will become stronger! i had some honey oikos yesterday. it's great stuff!